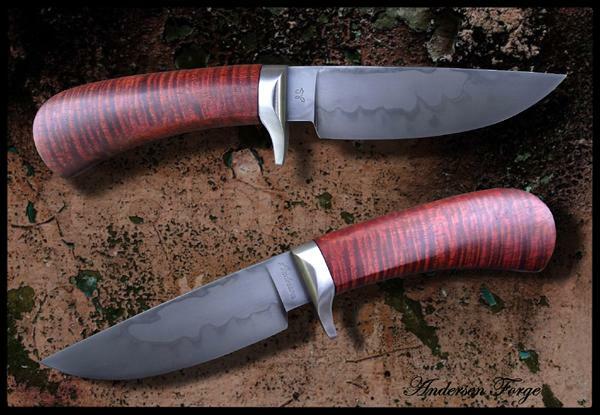 I thought that here, I might show the knives I made for the 2016 Blade Show in Atlanta. Please keep in mind that, as a full time knife maker, I must constantly be making and shipping knives out the door to keep food on the table. And I have a two year waiting list. This makes it a bit difficult to create a large inventory of knives for a show. 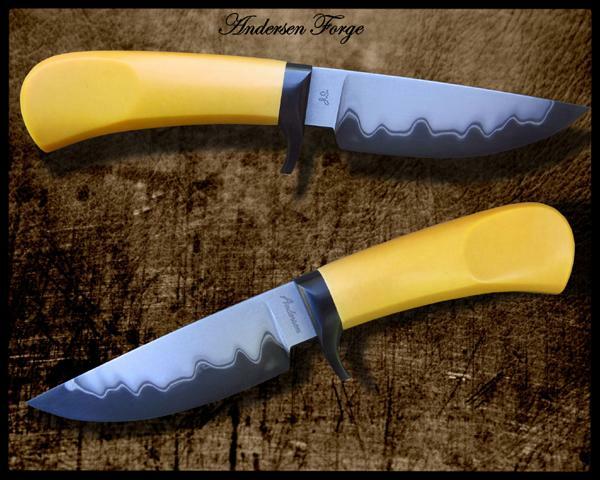 This year I was able to make 6 knives for Atlanta, and by show time four of them are alreay sold. 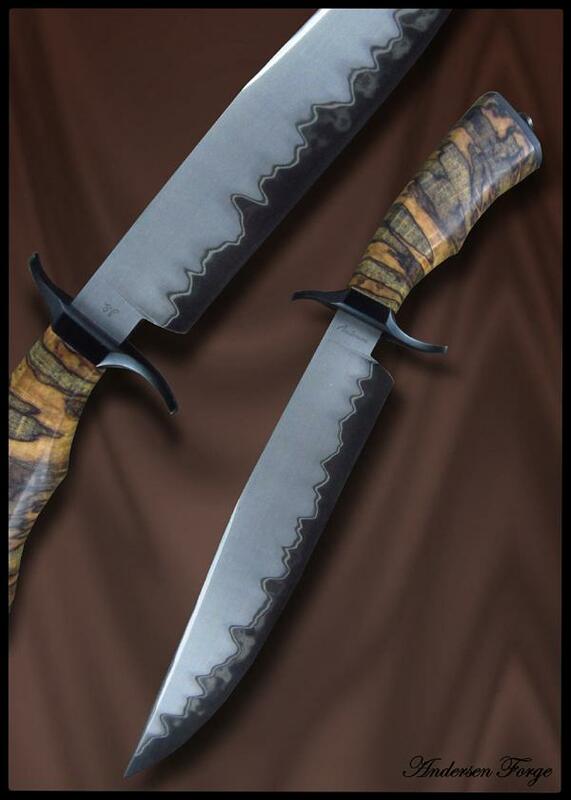 In essence, I will be travelling to Atlanta with 2 knives to sell. I got a chunk of Spalted Pecan from a friend a few years back and cut it up into blocks and had them stabilized. I thought the black-line spalting would lend itself well to accentuating the hot-blued milde steel take-down fittings and the black etched 1095 in the San-Mai. I've made a dozen or so of these over the years and always enjoy the color contrast of the San-Mai, the hot-blued fittings and the 100+ year old Bakelite. I got some pretty decent activity out of the Hamon on this W1. I enjoy making them when I get the visible black transition lines. The take-down fittings are 416 stainless steel. 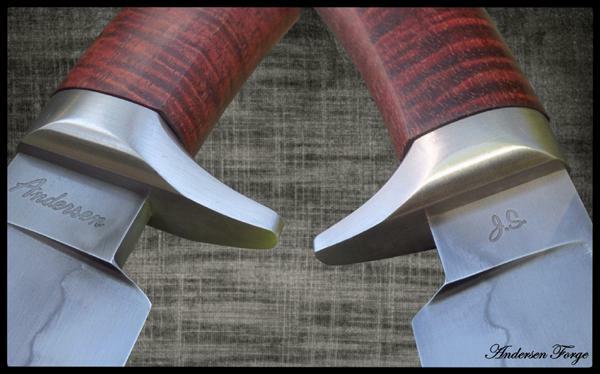 Making these blade is quite an elaborate affair. Forging and creating the opposing twists of multiple bars and getting successful stacking welds is quite time consuming. I go to a great deal of effort to keep things moving smoothly, yet remain at welding heats long enough to ensure good welds. I don't just get 'em stuck and then call it good. The blade was hot-blued after etching. Hot-blued mild steel take-dwon fittings and a fabulous black of Australian Ringed Gidgee round out the package. 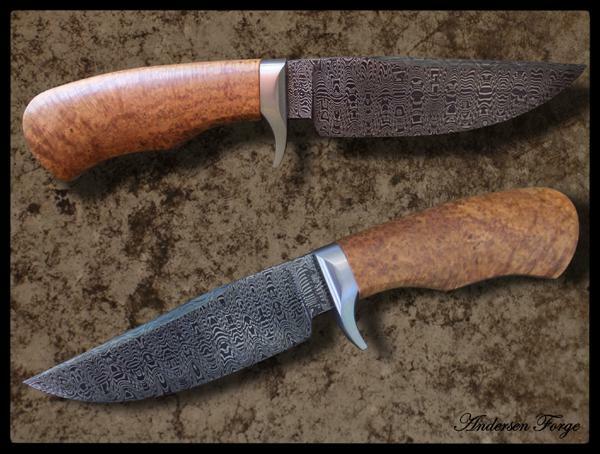 I forged the blade for this knife from a billet of what is called "Crushed Ws" and laddered the pattern for this dramatic effect. The handle material is a block of stabilized Black Ash Burl from right here in my neighborhood. Not seen in this photograph is the cover for the take-down finial, which is moose antler. A 416 stainless guard finishes off the package. 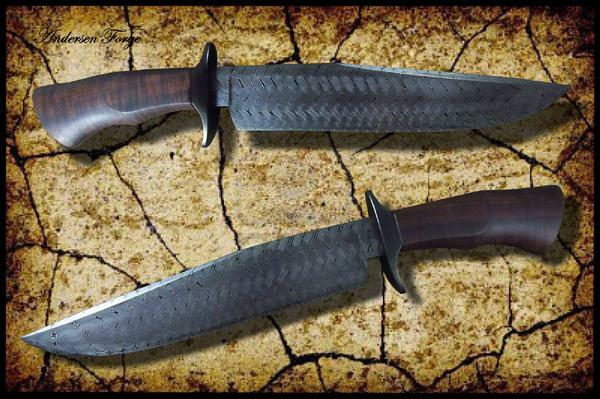 Nice one here - this blade was forged from a billet of 216 layer 'single twist' Damascus. 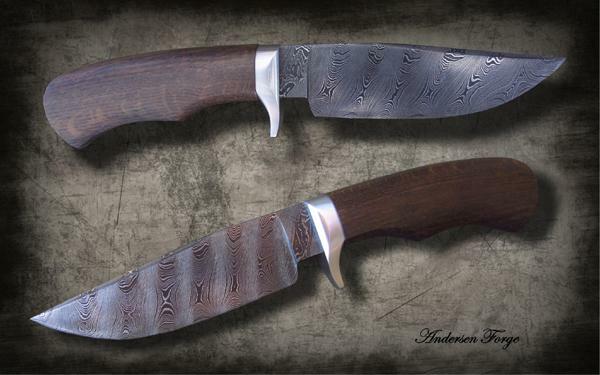 I then hot-blue my Damascus here at Andersen Forge. The handle for the knife, which is all take-down, is 3720 year old Bog Oak. Isn't that amazing? 37 centuries ago a tree made its way to the bottom of a bog and sat there until now. It was then stabilized.